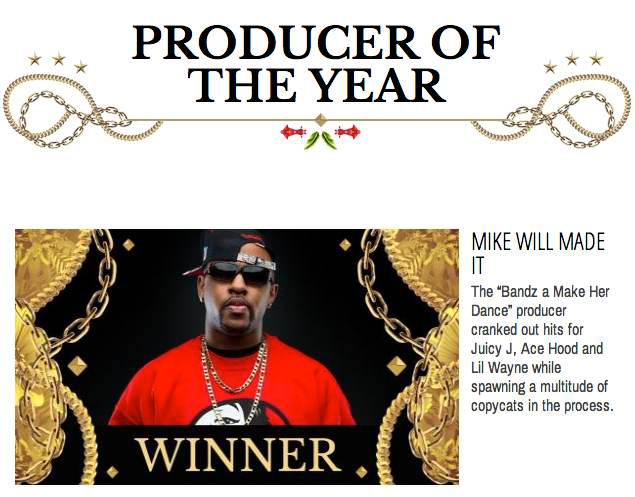 24-year-old super producer Mike WiLL Made-It was named rap’s top producer at the 2013 BET Hip-Hop Awards, which aired this week. Other producers nominated in the category included Pharrell Williams, DJ Mustard, Hit-Boy, and J. Cole. The award comes on the heels of WiLL having produced more than a dozen Billboard-charting singles in the past two years, working with artists including Miley Cyrus, Jay Z, Kanye West, Rihanna, 2 Chainz, Lil Wayne, Future, Juicy J, Ciara, and more. Last month, Mike WiLL announced his own debut album, Est. In 1989 Pt. 3, releasing the album’s lead single, and subsequent video, “23,” which features Miley Cyrus, Wiz Khalifa, and Juicy J. With nearly 50 million plays on VEVO, and adds at radio across the country, the single is currently #14 on Billboard‘s Hot 100 charts and #4 on Billboard’s Hot R&B/Hip-Hop Songs chart.